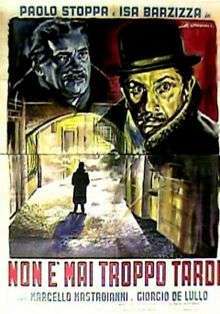 It's Never Too Late (Italian: Non è mai troppo tardi) is a 1953 Italian comedy film directed by Filippo Walter Ratti. The film is based on the novel A Christmas Carol by Charles Dickens. Antonio Trabbi is a greedy old man with a very rough personality and obsessed by money. He deprecates charity and love and has no friends or love interest, being lonely and avoided by people. On Christmas Eve he is visited by the ghost of his former business partner, who warns him about his life-style and announces the visit of three spirits, who will show Antonio past, present and future Christmas days. During the night, the three spirits actually appear to Trabbi, showing him his sad past, the bad reputation he has with everyone and the bad outcome of his actions, which will lead him to a lonely death and to terrible punishments in Hell. When Trabbi wakes up he is greatly distressed by the visions and eager to change his life, starting with that very same Christmas Day. ↑ "The Complete Index To World Film: It's Never Too Late". CITWF.com. Retrieved 15 March 2009.